Justice Russell Brown was born in Vancouver on September 15, 1965, and grew up in Burns Lake, British Columbia. He received a Bachelor of Arts from the University of British Columbia in 1987 and a Bachelor of Laws from the University of Victoria in 1994. He also received a Master of Laws in 2003 and a Doctor of Juridical Science in 2006, both from the University of Toronto. He has been married since 1994 to Heidi Brown and they are the parents of two children. Justice Brown was admitted to the Bar of British Columbia in 1995 and to the Bar of Alberta in 2008. He was an associate at Davis & Company (now DLA Piper LLP) in Vancouver from 1995 to 1996 and at Carfra & Lawton (now Carfra Lawton LLP) in Victoria from 1996 to 2004. From 2008 to 2013, he was associate counsel to Miller Thomson LLP. From 2004 to 2013, Justice Brown was a member of the Faculty of Law at the University of Alberta, both as a professor (tenured from 2009) and for the last two years as an associate dean. His main areas of practice were commercial law, medical negligence, personal injury, insurance law and trusts and estates. Justice Brown is the author of a treatise on claims under negligence law for economic loss, as well as the author or co-author of over 30 published law review articles, book chapters and review essays on tort law, property law and civil justice. He is a regular contributor to academic and professional conference proceedings in Canada and internationally, and in Canadian judicial education seminars. Justice Brown presently serves on the editorial board of the University of Toronto Law Journal and, prior to his judicial career, served on various committees of the Law Society of Alberta, including those on credentials and education, and civil practice. He also served as chair of the Health Law Institute of the University of Alberta, chair of the University Appeals Board and Professional Review Board at the University of Alberta, and as member of the governing board of the Canadian Forum on Civil Justice. He also served on the Advisory Board to the Salvation Army in Victoria and in Edmonton, including as chair in Edmonton. On February 8, 2013, he was appointed to the Court of Queen's Bench of Alberta. He was then appointed to the Court of Appeal of Alberta on March 7, 2014. As a Court of Appeal judge sitting in Edmonton, Justice Brown also served as a Judge of the Court of Appeal for the Northwest Territories and a Judge of the Court of Appeal of Nunavut. 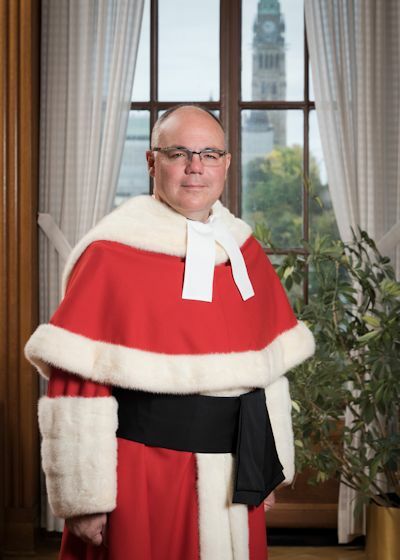 He was appointed to the Supreme Court of Canada on August 31, 2015. Webcast of the ceremony in honour of the Honourable Russell Brown, held on October 6, 2015.